Stewart-Haas Racing driver Kurt Busch secured his first win since the 2017 season-opener by snatching victory in during a dramatic NASCAR Cup Series race at Bristol. 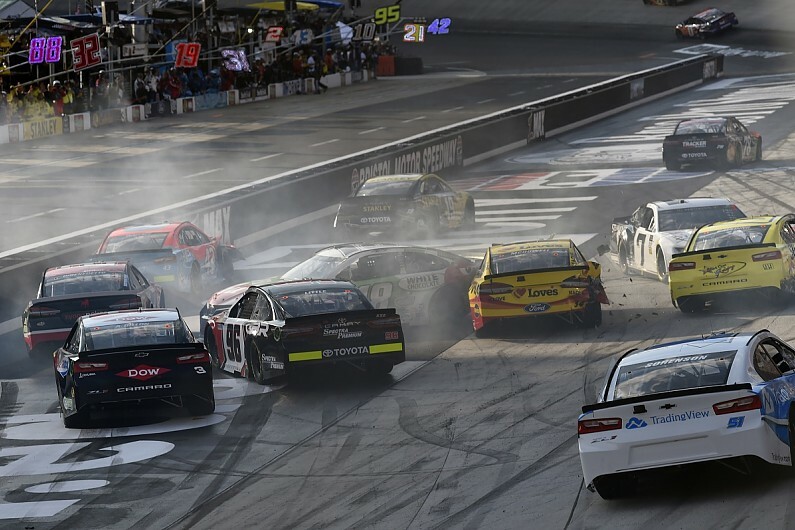 Having finished seventh and ninth in the first two stages, Busch first took the lead with 24 laps of the 500-tour race remaining by beating team-mate Clint Bowyer - who shared the front row - away at a late restart. A puncture and spin for Kyle Busch with 16 laps remaining meant that his brother Kurt then had to survive another restart. Despite restarting in second, Bowyer slipped backwards and Chip Ganassi Racing's Kyle Larson emerged as Busch's closest challenger. Having pitted on lap 474, Larson's tyres were 32 laps younger than Busch's. But the SHR driver was able to hang on to end a win drought stretching back to the 2017 Daytona 500, 58 Cup rounds ago, and book his place in the playoffs. Autosport recently revealed that Busch is set to leave SHR to replace Jamie McMurray at Ganassi at the end of the year. Despite leading the race early in stage one, polesitter Larson dropped down the order as the race progressed before recovering late on to finish second. After he took the lead of the race from Chase Elliott mid-way through the final stage, Bowyer's main threats for victory with 100 laps remaining were Martin Truex Jr and Kyle Busch. Both had been involved in a 12-car pile-up on lap two of the race. Busch tagged Penske's Ryan Blaney, spinning in front of the field and collecting several cars, including Truex. Truex and Busch battled back to second and third respectively with 70 laps remaining - Busch's recovery in spite of having dropped to two laps down due to the extensive repairs that were required. But as Busch challenged Truex, he tagged the rear of the #78 Furniture Row Racing Toyota and pitched the champion into the inside wall. Truex was eliminated from contention. Busch's night was hindered by the damage sustained in the lap two incident, as the rear bodywork damage complicated refuelling. He dropped from second to 11th on lap 474, making contact with Chris Buescher that led to his eventual puncture. Elliott, who lost track position as stage three progressed, surged through the field in the final 14 laps after Busch's spin, climbing from ninth to finish third. Both Elliott and stage two winner Joey Logano passed Joe Gibbs Racing's Erik Jones in the closing laps. Logano ended up fourth and Jones was fifth. Losing out at the final restart, Bowyer finished in sixth despite having led 120 of the final stage's 250 laps. Ryan Blaney was seventh. He won the opening stage, narrowly beating Kevin Harvick in a photo finish. Harvick's challenge was curtailed early in stage two when he suspected a puncture on his SHR Ford. He pitted during green flag conditions and ended up two laps down in the process, then could only recover to 10th.